Hamster has large cheek pouches which are used for storing and transfer of food. Fully expanded cheek pouches can increase head size two or three times. Hamsters are rodents of the family Cricetidae. There are 25 hamster species. The first known wild hamsters can be traced back to countries such as Syria, Belgium, portions of northern China, Greece, and Romania. Hamsters are most common in dry, open habitats. They live in deserts, plains, sand dunes, steppes, shrublands, rocky foothills, river valleys, agricultural fields, gardens, and orchards. Hamsters may be found at elevations up to 3,600 meters (11,800 feet). Common pets throughout the world, hamsters are small, cute and readily available in the pet trade. These balls of fur are generally friendly with people. Hamster is an omnivore. Its diet is based on seed, fruit, vegetables and insects. The five hamster species most commonly kept as pets are: Syrian, Roborovski, Campbell’s Dwarf, Chinese and Winter White Russian Dwarf hamsters. Hamsters have a relatively short lifespan, about 2-4 years. Babies are naked and blind at birth. They depend on the mother's milk until the age of 3 to 4 weeks. Some species of hamster reach sexual maturity at the age of 4 to 5 weeks, while others start to breed at age of 4 months. Hamster uses its front and hind feet and teeth to dig burrows in the ground. Burrows have several entrances and separate chambers for storing of food, nursing of babies and resting. The various species of hamsters range in size from approximately 5 centimeters (2 inches) long to over 33 centimeters (13 inches). The most common pet hamster, the Syrian hamster, also known as the teddy bear hamster or golden hamster, usually grows to about 13 to 18 centimeters (5 to 7 inches) long. Hamsters have compact bodies, small, furry ears, short legs, wide feet, and short stubby tails. Hamsters are nearsighted and colorblind, but it has excellent sense of smell and touch (on the whiskers) which facilitate detection of food and navigation in the wild. Scent glands on the flanks are used for marking of trails. Their fur comes in a wide variety of colors and shades including white, black, yellow, brown, grey, or a mixture of these colors. Most hamsters are strictly solitary. In the wild, hamsters are more crepuscular (active in twilight) than nocturnal (active at night) and remain underground during the day to avoid being caught by predators. Hamsters are generally quick moving and have an amazing amount of stamina for a rodent, they run at 3-5 km/h (2-3 mph) for long periods of time and 8-11 km/h (5-7 mph) for short distances. Hamster is active at dusk and dawn (crepuscular animal). Hamsters are terrestrial animals and their feet are modified for cursorial locomotion. Some hamsters can swim quite well by filling their cheek pouches with air, giving themselves buoyancy. All hamsters are excellent diggers, constructing burrows with one or more entrances, with galleries connected to chambers for nesting, food storage, and other activities. A behavioral characteristic of hamsters is food hoarding. They carry food in their spacious cheek pouches to their underground storage chambers. Hamster burrows have been found with as much as 90 kilograms (200 pounds) of stored food. Hamster has sharp incisors (front teeth) that never stop growing. That's why hamster chews various items most of its time to "trim" its teeth naturally. Hamsters are omnivores. Wild hamsters eat seeds, grain, nuts, grasses, plants, vegetables and fruits as well as some insects. Although pet hamsters can survive on a diet of exclusively commercial hamster food, other items, such as vegetables, fruits, seeds, and nuts, can be given. Hamster has large eyes, small, furry ears, stout body, short legs with wide feet and short tail. Pregnancy lasts 16 to 30 days and ends with 7 babies on average (up to 24 babies in rare instances). Female can get pregnant immediately after giving birth (later that same day). When litter is too big, mother eats some of the babies to ensure enough resources for the remaining babies. Hamsters have poor eyesight; they are nearsighted and colorblind. Equipped with an acute sense of smell, hamsters are able to distinguish each other by scent and, if handled often, also can recognize their owners by smell. They are particularly sensitive to high-pitched noises and can hear and communicate in the ultrasonic range. Also, there are sensory nerves on the end of each whisker, which help them to feel their surroundings and navigate in the dark. Hamsters are not true hibernators, but they do experience long bouts of torpor, lasting several weeks at a time, during the winter. Syrian hamster hibernates during the winter hidden inside the underground burrow. Hamsters are seasonal breeders and will produce several litters a year with several pups in each litter. The breeding season is from April to October in the Northern Hemisphere, with two to five litters of one to 13 young being born after a gestation period of 16 to 23 days. After the birth, the litter is blind until they are two weeks old and at 3 to 4 weeks the young are weaned. Hamster has thick, silky fur that can be uniformly black, grey, creamy, white, brown, yellow or red colored, or multicolored (mix of some of these colors). Predators can include owls, weasels, storks, jackals, wild cats, snakes and any other creature that would eat mouse like animals. Hamsters can be aggressive and do not hesitate to defend themselves from predators with their large incisors. Females sometimes protect their young from predators by carrying them in their cheek pouches. Like many other rodents, hamsters have continuously growing teeth, and they must chew or gnaw constantly to keep them from growing too long. Hamster can reach 2 to 13 inches in length, depending on the species. 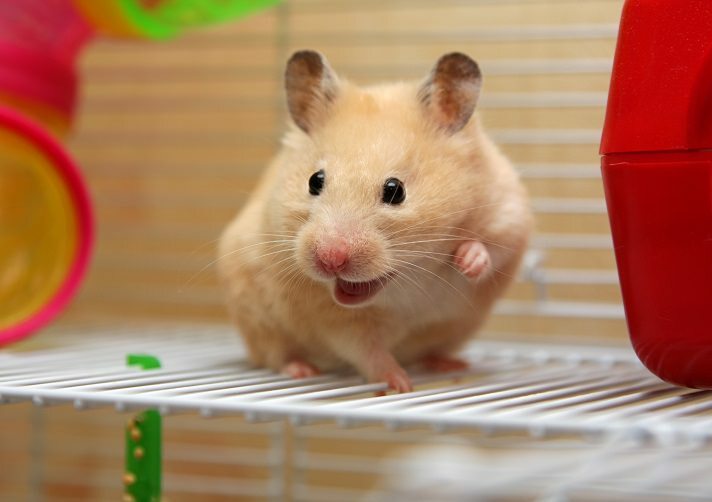 The name “hamster” comes from the German word hamstern, which means “to hoard” alluding to its hoarding habits. Hamsters are closely related to other small rodents including mice, rats and voles. The reason hamsters adore hamster wheels is easy: the tiny rodents are born to run. It comes naturally to them. Hamsters truly enjoy running, plain and simple, and their species as a whole are very energetic and lively. It is not uncommon to record distances of 9 km (5.6 mi) being run in one day. Hamster is solitary and territorial animal. Hamster wheels are 100 percent vital for keeping hamsters happy, healthy and physically fit. But if their wheels are too small, they can cause pain, spinal problems, and even lead to arthritis. Mating season of hamsters takes place during the spring and summer. Females produce few litters per year. The IUCN currently lists one species as endangered (the popular pet, golden or Syrian hamsters), one as vulnerable (Romanian hamsters), and one as lower risk (gray dwarf hamsters). Hamster has an average lifespan of 2 to 2.5 years. Some species (Russian hamsters) can survive up to 4 years.